There is no doubt in my mind that our dependency on mobile phones will continue to increase. I’m not going to try and justify this statement because this is quite simply a fact, and with that fact comes a tremendous amount of opportunity. A friend of mine has been digging into this space and I thought his current approach, tactics and projects were worth sharing. David Alson was born and raised in the New York City area and is currently a senior at Miami University in Oxford, Ohio. He is studying Electrical Engineering and Computer Science, with hopes to pursue a career in the technology industry after graduation in the spring of 2011. Dan Reich: I understand you’ve developed some iPhone apps. Could you talk a little bit about those, and your experiences in creating them? David Alson: During the summer of 2009, I bought an introductory book on iPhone programming and started teaching myself how to build apps. I built some basic apps to get used to the environment and Objective-C, learn about the Cocoa Touch framework and experiment with features of the iPhone I have never programmed for before, such as the accelerometer, camera and touch screen. The first app that I released to the App store was a generic countdown to the 2010 New Year. I wanted to put something in the store so I could see first hand what the process was like and how the App store made and recorded sale transactions. The second and third app that I put in the store was a game with a free version with ads and a 99-cent version called BallFall, which I decided to make for two reasons. The first reason was because I wanted to see how much I had taught myself about iPhone programming. I figured creating a game would be the most fun in the end and also be something that I would be willing to put in the store after it was done. The second reason was because the games category is the most successful category in the App store and I wanted to see how well ads do in free apps. DR: What projects are you working on now? DA: In addition to my electrical engineering course work, several projects I am currently working on include the Miami University App, Track ‘M, which will be integrated into the Miami App, and my first mobile game, BallFall. 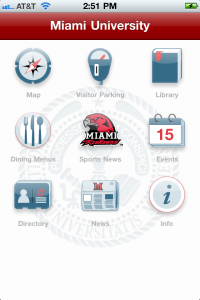 The Miami University App was designed for current students, perspective students and parents, all Miami University faculty members, and especially new freshmen in need of a portable assistant to help with the transition into their new collegiate lifestyle. Some features of this app include a map of campus with building information, visitor parking information, dining menus to see what is being served in the dining halls across campus, sports and events news and a directory to search for contact information for all students, faculty and staff at the university. Track ‘M is projected to be a live GPS bus tracking system for the Miami University transit system. This application is currently being designed to be incorporated into the Miami University App so those interested in accessing and utilizing the MU transit system will be able to access and view live locations of each bus and receive approximate bus arrival times at the desired destination. Lastly, BallFall, which as previously mentioned, was designed as a personal examination of various aspects of the mobile market and a way to examine my own abilities with Objective-C. I am currently working on introducing an online leaderboard to feature high scores, which I decided to incorporate after taking a class on web services and SOA. I anticipate its release within the next couple weeks. Those projects can be seen below. DR: Where do you see the biggest opportunities in the mobile space? DA: I believe there are two areas that have high potential for opportunity and growth within the mobile space—the medical industry and the education system. With a huge percentage of the population carrying mobile devices now, the medical industry has an opportunity to change how practitioners monitor and deliver vital information to their patients. After hearing about the implementation of mobile devices in the classroom resulting in higher engagement and participation levels, I feel the education system is currently presented with an opportunity to redesign traditional methods into a more modern system that is interesting to both students and faculty. DR: What do you think about the current education system? DA: I believe there is a technologic disconnect between students and educators. Many educators are resistant to having mobile devices in the classroom, while students are inevitably going to use them anyway, be it for texting or accessing the internet. Current students are growing up with mobile devices and the education system needs to expedite its transition into the mobile world of today. DR: Do you teach things to yourself in order to get things done? If so, how? DA: Absolutely. When there is a concept I do not understand, the first place I look for answers is the Internet. I feel it is the most efficient tool for finding answers because it provides a variety of perspectives on the subject. View more documents from danreich. View more presentations from danreich.